So You Think You Can Mom? : Giveaway: Miles for Melanoma 5K at Universal Studios Hollywood! Giveaway: Miles for Melanoma 5K at Universal Studios Hollywood! The Melanoma Research Foundation (MRF) invites you to join us for the 4th Annual Miles for Melanoma 5k Run/Walk at Universal Studios! 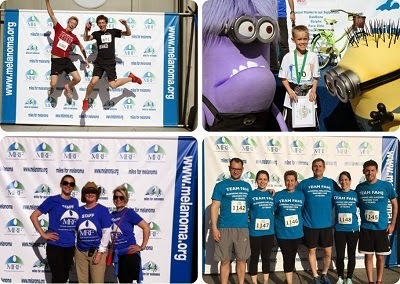 This family-friendly event has raised almost $800,000 for melanoma research, advocacy and education! Participants will experience a fun day exploring some of their favorite movie sets, like Jaws, Back to the Future, Charlie’s Angels, Bruce Almighty, Spiderman 2, the War of the Worlds plane crash and the village of Whoville. Afterward, they will enjoy street fair-type booths with free samples and tips on how to face the sun safely, and popular food trucks will be on site with refreshments. Qualified medical professionals will be available to give interested participants free skin screenings. Join the MRF for a fun-filled and educational day while raising awareness and critically-needed melanoma research funding! Good Luck & Get Ready!